North Water Tower was installed as part of the construction of the North Wester Stub branch and station, which was completed and opened on November 17, 1908. 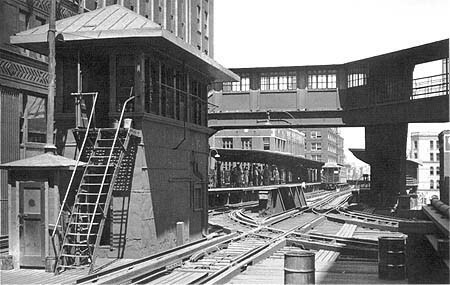 The tower, located on the south side of the double-track turnout from the North Side Main Line to the North Water Stub and, after 1930, immediately south of Merchandise Mart station, controlled the junction, as well as the "L"'s switches and signals associated with the Wells Street Bridge. On July 31, 1949, the CTA instituted its North-South Route service revision, which included discontinuance of scheduled service out of the North Water Terminal. The stub was retained for emergencies and other non-revenue purposes, however. North Water Tower was closed on August 10, 1956, with the operating controls for the Wells Street Bridge being transferred to Tower 18. Hand-throw switch stands were installed at the switches leading into North Water Terminal and the tower was subsequently demolished. North Wester Stub was closed on June 21, 1963 and the switches were removed. Correspondence with Kendrick Bisset, former CTA Director, Power and Way Engineering, 2011 April 29-30.